These are some artist trading cards for a private trade. I did a quick bird drawing and colored in with watercolors called Raven. I may add a bit of black to the birds eyes because there seems to be too much blue going on. These are some of my latest artist trading cards for a Queen Swap. I am hosting a Queen themed swap on Monday Artday ATC a Ning group. 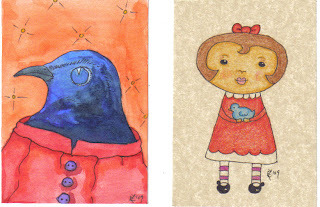 Monday ArtDay ATC is really a great site. Most are illustrators. All the members are very artistic. These are the three Queen ATCs I have made for the swap. These are done in acrylics.